Body Art Campaign is an annual event that supports many issues in the society like sexual exploitation, charity, health education like breast cancer and the idea of the rights of your own body. Art can be used on many media including your own body. Body art is a way to express many ideas that is believe stronger than the other media because we will see it directly on humans’ body. The art includes body painting, tattoo, piercing and etc. The Body Art Program inspects and licenses body art facilities in Columbus and Worthington and regulates the operations of the body artists. Body painting itself has a rich history from the ancient times. The culture of body painting as the body art have been done by tribes which used to paint their body with natural pigment such as clay. 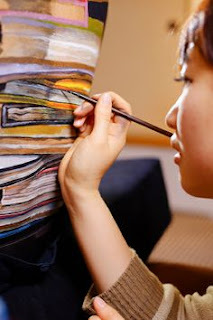 The practice of this ancient body painting is believed still exist. Some art critics argued that body painting is actually not an art because it is just temporary and can be labeled as a performance or conceptual art intervention. 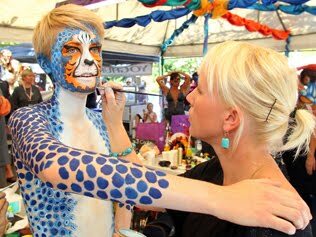 While in the other side, one of the biggest modern event of body painting was celebrated in Austria and that was the 19th annual body painting festival which was followed by hundreds of body art painters from more than 46 countries in Europe. The next annual event will be celebrated in Lisse near Amsterdam in the Netherlands and invites a lot of artists to join the crowd with music and colors. Punching Bright Colors? Why Not?